I got a lot of questions about the review of peer-to-peer lending sites last Monday so I thought I would run through the process of getting a p2p loan. I’ve used peer loans a few times and have found it’s the best way to get quick loans and lower rates, and a much better alternative to payday loans. If you need money today to avoid late charges or to pay past-due bills, payday loans are still probably going to be your only option for the quickest loans. If you can wait just a day or two, which is almost always the case if you just talk to the creditor, then p2p loans can get you the money you need at a fraction of the interest rate. For fast cash, you’ve really got three options. While you can get a payday loan in as little as a day, rates can exceed 500% on an annual basis and can trap you in a cycle of using more loans to pay off older ones. Personal loans usually have low credit requirements and can usually be deposited in your bank account within the next business day. Rates on personal loans start around 10% and can go as high as 36% on some sites. Peer loans may not be the quick money option of the three but are still pretty fast with money in your account within two or three days. Credit score requirements are only slightly higher than personal loans and interest rates start at just 6% on the two largest p2p sites. 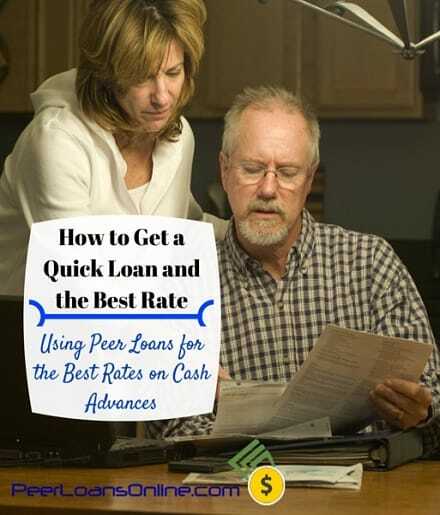 The two or three days it takes to get a peer loan may be slower than the payday or personal loan option but it’s still much faster than the average of two weeks it will take to get a bank loan (and that’s if you qualify on very strict requirements). The process for getting a peer loan through the two largest p2p sites is basically the same. Prosper Marketplace requires a FICO score of 680 or higher with rates starting at 5.99% and an origination fee of just 0.5% for AA-rated loans. 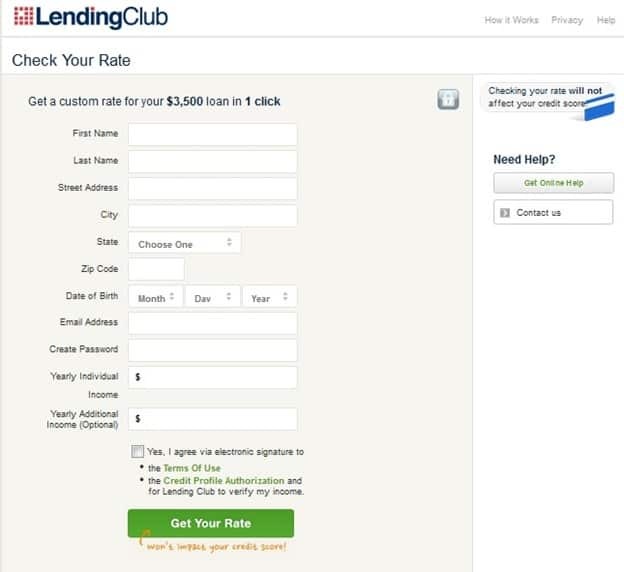 Lending Club requires a credit score around 660 FICO but rates seem to be a little lower for good credit borrowers. Don’t worry if your credit score is below 660 FICO, I’ll detail another p2p online lender in the next section that works as well as these two and offers some extra advantages. I took out a Lending Club loan last year to pay off credit card debt I built up after attending a conference in North Carolina. The annual percentage rate on my credit cards was 16.2% which meant I would end up paying $942 in interest if I paid the card off over three years. The first step in getting a peer loan is entering some basic information and how much you want to borrow. The p2p site then does what is called a ‘soft’ check on your credit just to verify the information you supplied. The soft inquiry is also used to set the interest rate on your loan. This doesn’t go on your credit report and doesn’t affect your credit so I usually recommend you compare the rate on a couple different sites to get the best deal and the quickest loan. The credit verification is done almost instantly and you’ll be able to see the interest rate and monthly payments on your loan. My 11.5% rate meant that I would save $287 in interest on the loan and my payments would be nine dollars less per month. If I made the same monthly payment that the credit card would have charged, I would save another $83 in interest and pay the loan off three months sooner. If your credit score is below 640 and doesn’t qualify for a p2p loan from Lending Club or other lenders, try PersonalLoans for a personal loan on comparable rates. The p2p loan website can accept borrowers with credit scores of 580 FICO and your loan is funded immediately. I’ve used both PersonalLoans and Lending Club for peer loans and there’s a lot to like about both. PersonalLoans uses a system where it shops your loan around to find the best interest rate from different lenders. It can also offer more types of loans like personal loans and bank loans compared to Lending Club which only offers peer loans. The way the p2p loan process works is that your loan goes on the website and directly to investors. Investors don’t see your contact information, just the financial information on your loan. Investors then decide to fund your loan which can take as little as a few hours but generally takes a day or two at most. One way to speed up the process of getting a peer loan is by only asking for as much as you need. This means your loan can be funded by fewer investors and you’ll get the money faster. Sometimes, the peer lending website will ask for documents to verify your income or employment. Lending Club asks about one-in-three borrowers to verify their income, usually through a copy of their most recent paystub. The site asks about two-in-five borrowers to verify their income source, usually through a W-2 form or tax return. The best way to speed up the process and get your money as soon as possible is to put together all the documents the peer lender might need for verification. If you’ve got one or more of these documents available, faxing or emailing a copy to the website can speed up the time it takes your loan to get funded. These quick loans can be deposited in your account within a business day though most usually take about three days. Of the three personal loans I’ve gotten from p2p sites like PersonalLoans and Lending Club, all were faster than traditional bank loans I’ve used. My first personal loan took four days to get deposited but only because I took two days to get all my documentation. The other two loans were deposited into my account the next business day. Even if you have to wait for your employer to print out a document or have to find your most recent tax return, most loans can be deposited in your account within the week. That’s not bad considering the cost savings against a payday loan and the time it takes to get a traditional loan from the bank. If you have a few months before you need your loan, try improving your credit score a little to get the best rate available. My first peer loan was a small amount to consolidate and pay off my high-interest credit card debt. It saved me money in interest but also shifted my debt to a better category, non-revolving debt. Doing this increased my credit score by 20 points in just a few months and I was able to get a larger loan at a lower rate. Quick loans don’t have to mean high interest rates so make sure you shop around on some of the personal loan sites and p2p platforms. Peer loans have opened up a whole new world in getting the money you need, when you need it. You just have to know how to use them. We are in an unexpected financially scary situation: we have to move out of the house we were supposed to be able to rent for at least two years. We’ve been here 13 months. The owner is selling. Our plans were to get financially secure by catching up with filing taxes, fixing our credit by getting bad information deleted and raising scores. Goal was to buy the next house instead of renting another one. We were making progress when we got notice to vacate. Time is running out and we need $5k to move. Boyfriend is still recovering from emergency open heart surgery and isn’t back to working full time. His income right now is 1/3 of what mine is. His credit score is also lower than mine. My income comes from two jobs, my DTI 26% but my highest paying job is working as a personal assistant, paid cash. She will give me check or income stubs if I ask, and will verify my job and salary. My other job is driving for Uber with verifyible gross income. For the next 3 years I will also receive a $10k payment in January. We haven’t filed taxes in a long time but we don’t have any liens. Should I apply with all income sources listed, and have her write out my check stubs, and should we apply jointly? It’s usually best to apply for a loan jointly. Lenders are pretty good at seeing through some of the credit report noise. I would start by applying on 2-3 loan sites to see what you hear and what loan rates are offered. Most sites don’t verify income, maybe on 5% of applications, so list your income and then have your employer verify if needed.